HF: The first mention of a bakery in a Hong Kong newspaper I can find is that of Dorabjee Nowrojee’s in Queen’s road next to P&O Steam Ship Company’s office. The advert, published in 1864, is dated 1860 so it’s rather odd that it suggests a newly opened business. 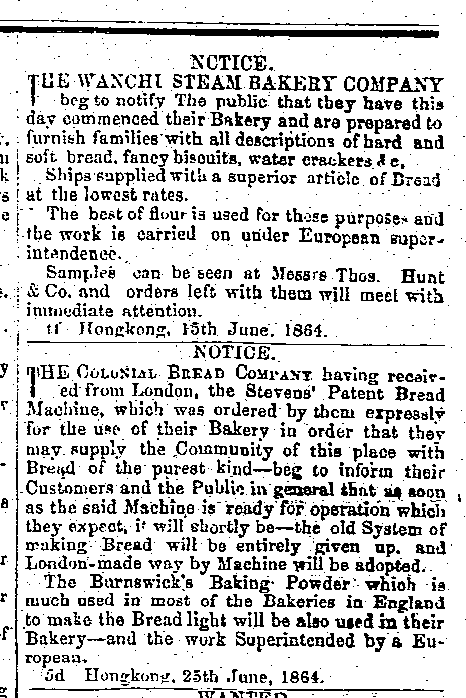 James Chan: The Wanchi Steam Bakery Company and The Colonial Bread Company had adjoining adverts in the Hongkong Daily Press 30th June 1864. 2) Thomas Hunt & Company was a ship chandler, dry dock and commission merchant firm based on the Pearl River near Whampoa, China with satellite offices in Hong Kong and Shanghai. The firm was founded by Salem, Massachusetts native Thomas Hunt in the mid 1840s and initially only carried dispatches between Canton and Whampoa. Hunt soon expanded his packet boat business to include a ship chandler. The company furnished American vessels with ship supplies and assisted in unloading goods and supplies for shipment to Canton to be sold at market. After having made a fortune, Hunt sold his business to fellow Salem natives James Bridges Endicott and James P. Cook in 1854 and returned home to Massachusetts. Thomas Hunt & Co. expanded business after Endicott and Cook took over, establishing a commission merchant business in Hong Kong with offices in Whampoa and Shanghai. 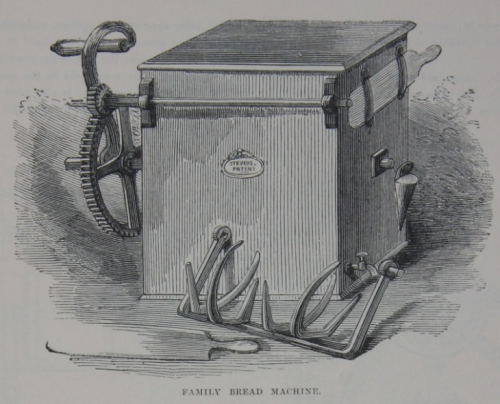 From the 1862 London Exhibition Catalogue. The company also manufactured Universal Cake and Pudding Mixers. This article was first posted on 21st September 2014.